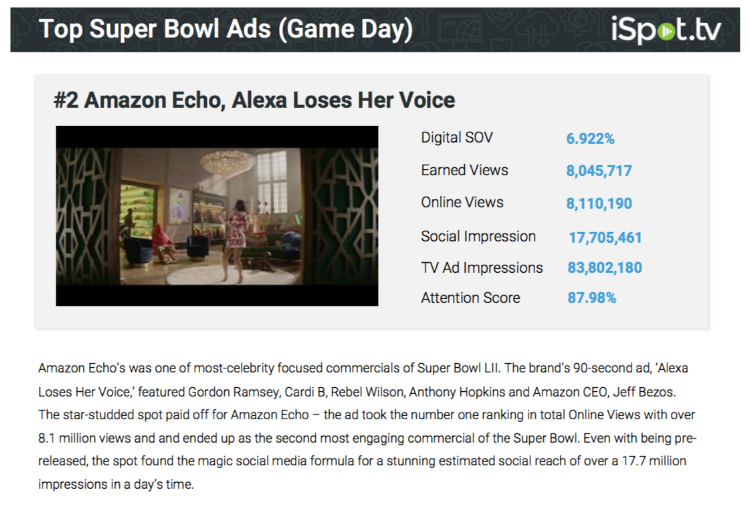 It has been almost 2 weeks since the Super Bowl has been played, but marketers are still seeing benefits from the costly commercial spots they paid for during the big game. As someone who has been around video production and commercial creation, I always see myself watching the commercials with a different perspective than others who watch them just to get a laugh or spark a discussion. As someone who was neither a Patriots fan (Although, I am from New England, and still not a Patriots fan) nor an Eagles fan, I was very attentive to the commercial breaks this year. Once the game was finished, I was interested in learning the statistics from the commercials that companies spent hundreds of thousands of dollars on. Recently, I received a report from iSpot.tv that did just that. I am not surprised to see that Twitter’s social actions were more than Facebook and YouTube COMBINED. With Twitter being a “Live Update” social channel, it makes sense that there were so many social actions during the big game. Compared to the prior Super Bowl, there was a decrease in social actions, but an increase in earned views. I would have thought those numbers would trend in the same direction as more views would correlate with more social actions; and it wasn’t as if the earned views were barely higher than the year before….it was 10 MILLION more views! One could possibly attribute the decrease in social actions to the trend of companies not “pre-releasing” their ads prior to the game. Only 44 brands pre-released their ads this year, which was the lowest number in the past three years. 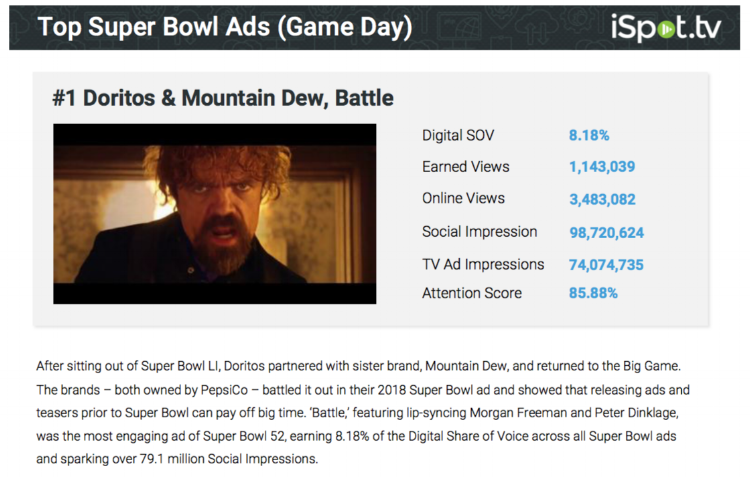 As a Game of Thrones fan, I was engaged in the Doritos lip-syncing by Peter Dinklage piggy backed by Morgan Freeman’s Mountain Dew lip-sync version. It was no surprise that this ad earned the title of the “Most Engaging Ad” of the Super Bowl. It is worth noting that this ad was pre-released with trailers and full advertisement. I found the Amazon Echo commercial to be amusing for the fact it incorporated a number of celebrities into the ad as did the rest of world. This ad was the ad with the most online views. At this point, everything that Amazon touches turns to gold! Tide made a huge push in the years Super Bowl advertising campaign. Despite being the victims of the most recent “Tide Pod craze,” their ads averaged an attention score of 93.35% (which was almost 4% higher than the average Super Bowl ad). Their idea of creating ads that “weren’t your typical ad” always left viewers with the notion that the start of every commercial could be for something different than a laundry detergent product. NFL Touchdown Celebrations featuring Eli Manning and Odell Beckham Jr.
You didn’t have to be a fan of the Giants to appreciate this one. With the NFL cracking down on touchdown celebrations, it was comical to see Eli Manning and partner performing the Dirty Dancing routing compiled with the signature lift. As the official beer of the NFL, Anheuser-Busch really made an impactful statement with this commercial. As this nation has been hit with many natural disasters recently, it was very refreshing to showcase a huge corporation’s effort to help out those in need. As someone who rarely eats guacamole, this ad was educational as well as humorous. Their notion to “spread” the awareness that avocados can be used on other foods was a great way to generate buzz for people who might not necessarily want to dip their chips in guacamole. This commercial was not actually listed on iSpot.tv’s report, but it was one of my favorite commercials. This one impacted me a little more since I am a young adult and am in the beginning stages of saving for retirement. ETrade did a clever job of getting an important statistic across to viewers, but did so in a way that was not boring to the viewer and proved to be quite funny.